Chances are, you'd rather spend your money on college than on taxes. At College SAVE, we get that. 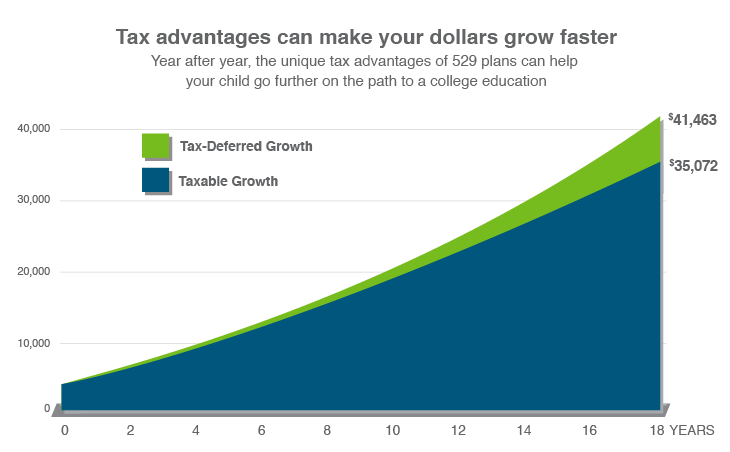 That’s why our 529 plan offers tax advantages not provided by other college saving vehicles. With a 529 account, your savings has the potential to grow at a faster rate than if you had invested in a comparable taxable account. That's because, unlike a conventional investment, your 529 plan grows tax deferred. Assumptions: $2,500 initial investment with subsequent monthly investments of $100 for a period of 18 years; annual rate of return on investment of 5% and no funds withdrawn during the time period specified; taxpayer is in the 30% federal income tax bracket for all options at the time of contributions and distribution. This hypothetical is for illustrative purposes only. It does not reflect an actual investment in any particular 529 plan or any taxes that may be payable upon non-qualified distribution. 1Earnings on non-qualified withdrawals may be subject to federal income tax and a 10% federal penalty tax, as well as state and local income taxes. The availability of tax or other benefits may be contingent on meeting other requirements. 2The gift will be prorated over five years. In the event the donor does not survive the five-year period, a prorated amount will revert back to the donor's taxable estate. 3Rollovers from another state's 529 plan are not eligible for the state income tax deduction.